The Flexcharge digital timer is a 7-day, 8-event digital clock based programmable load controller. Multiple load ON and OFF times can be programmed and each day can be programmed with it's own unique timing pattern. Eight ON an eight OFF events can be programmed independently.For example: use one ON event to have a light come on at 7pm every day then use seven OFF events to turn the light off at a different time each day. The replaceable internal battery maintains the clock and programmed memory in the event of a system power failure (for up to 3 months). Consumes less then 3mA in standby mode. Internal DPST(double-pole-single-throw) relay switch can turn one load on at the same time that it turns another load off. Timer switch can handle up to 8 amps of inductive load or up to 16 amps of resistive load, at 6 to 36 VDC or 120VAC. 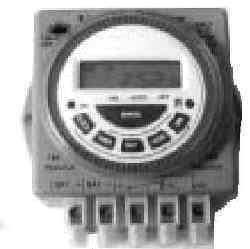 Timer requires 12VDC or AC to operate. Reverse polarity protected. Manual override allows the user to turn the load ON or OFF as desired. Easy to use terminal block for wiring.